Gene Autry Centennial Scully Shirt "Gene's Cowboy Boots"
This Scully shirt is inspired by the playing-card motif Gene Autry used on his cowboy boots throughout his entertainment career. 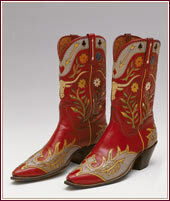 Several pairs of these boots are now in the Autry National Center's permanent collection. If you live by Gene Autry's Cowboy Code, you can now look the part in a shirt made especially to celebrate the Gene Autry Centennial.